When you're not trying so hard to make things happen, in that relaxed field of consciousness, your attention is open. An angel message can gently nudge, wake up and take notice. That's what happened this morning. My routine was interrupted as I gravitated toward my laptop first thing. Little did I know that the timing was in divine order. After a web search, I happened to look up and turn around from the computer screen. 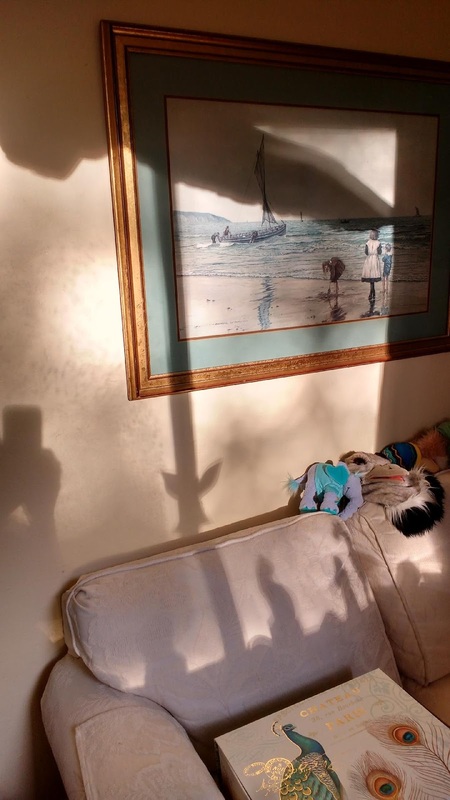 To my delight, the early morning sunshine, filtering through the large picture window, had created a telling silhouette composite on the den wall behind me. We all know that a picture is worth a thousand words, but this was a tender gift of heart. I marveled at how the various objects on the windowsill had clearly come together to teach a lesson on the power of faith. 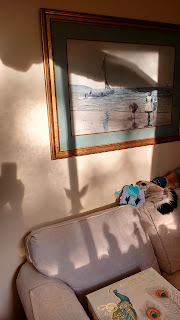 The large sheltering wings of the mighty eagle suspended from the den ceiling now had a column of "Light" that connected it to the silhouette of my hanging purple stained glass angel, a Christmas gift from my friend Joanna who passed on in July. Joanna had two cats, and so the soapstone cat bookends ended up being part of that perfect expression. And, the column of Light extended down to the earth plane, reminding me that we are all connected by eternal Love. Years ago, when I purchased that mighty eagle it was with Psalm 91 in mind. I'd been experiencing vision problems at the time and wanted the reminder to continually abide in the Shadow of the Almighty. Eagle Eye. 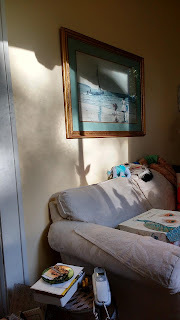 Until today, I'd never seen the eagle's wings shadowed on the wall in the daylight. In the middle of the night, while reading by lamp, the shadowing wings had appeared on the ceiling, bringing comfort. Synchronicity was in the work today. The daily God Calling reading for September 18, had set the stage for the light filled illustrations to come. shall abide under the shadow of the Almighty. HIDDEN in a sure place, known only to God and you. So secret that no power on earth can even find it. But, My beloved children, you must dwell therein. No fitful visit, a real abiding. Make it your home. Your dwelling place. Over that home shall My Shadow rest, to make it doubly safe, doubly secret. Like brooding mother-bird wings that Shadow rests. How safe, how sure, you must feel there. When fears assail you, and cares trouble you, when it is because you have ventured out of that protecting Shadow. Then the one, the only thing to do is to creep back into shelter again. So rest." I am so thankful for the angel messages that come to light to be shared. After I finished writing the blog, I turned around again. The scene had changed. The wall was blank. The sun had shifted. But I got it. To keep on abiding in the protecting Shadow and give thanks for He has given His angels charge over you.